In honor of National Yoga month, Exhale Spa is celebrating their second annual namasDAY on Thursday, September 20th, with FREE yoga classes at locations nationwide. Cristi Christensen is the Yoga Director of Exhale in Los Angeles and she unleashes her passion by teaching a variety of classes and workshops there. She has studied with world-renowned fitness gurus and traveled the globe spreading her knowledge and enthusiasm for yoga and all things fitness. 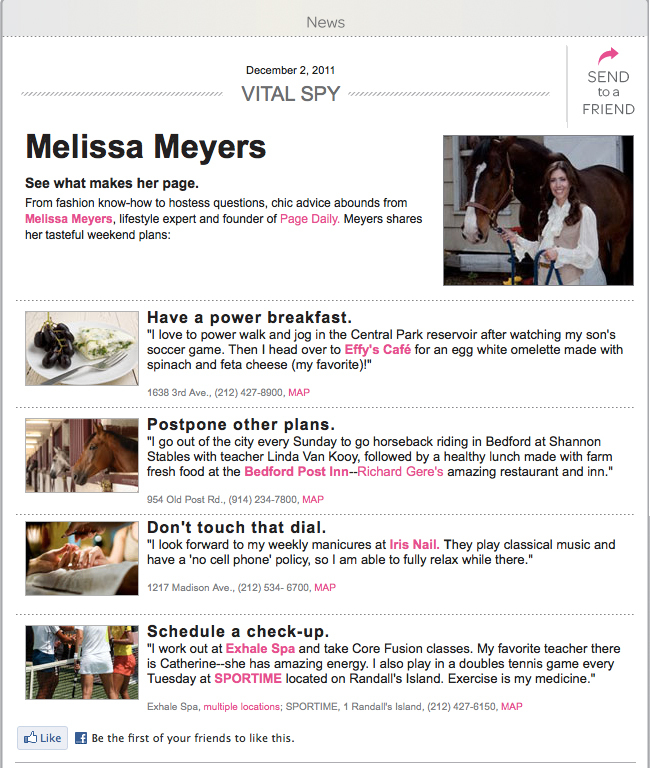 I caught up with Cristi after spending time with her at the amazing Exhale Spa retreat in Santa Monica last week. She gave me an insider perspective on practicing yoga and shared some of her health and beauty secrets. MM: There are many different types of yoga classes available today. How do you differentiate between them and what are the most popular practices? Any tips on how to choose? CC: There are many many different types of yoga; the key is finding the one that is right for you! Exhale’s yoga program falls under the Vinyasa style of yoga which is certainly amongst the most popular growing yoga in the U.S. Vinyasa is a rhythmic, flowing style of yoga with an emphasis in linking movement with breath. Vinyasa helps to not only build strength and endurance, but also enhances flexibility and brings the body and mind into a more relaxing, meditative state. MM: What advice do you have for someone who has never taken a yoga class but is eager to try it? CC: Start with a few beginner classes so that you can learn the basics of each one including the alignment techniques and the language; this way you can find the style that resonates with you. Let the teacher know you are new to class too so they can take extra good care of you! MM: What yoga class do you suggest for the toughest physical challenge? CC: Believe it or not, some of the most challenging classes I have taken have been Level 1 (beginner) as you are holding poses for a really long time! Level 2/3 classes usually move at a faster pace which definitely get your heart pumping and energy flowing! 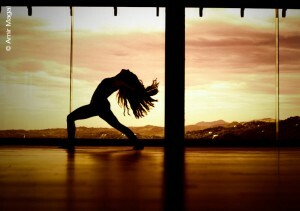 Vinyasa yoga is generally a very athletic practice- which will detoxify your body and take you to your edge! MM: What are some of the benefits of yoga and what has it done for you personally? CC: There are so many amazing benefits to this practice – physically, mentally, emotionally, even spiritually. To name just a few…Strength, flexibility, balance, focus, youthful body and spirit, calm mind, deepen connection with self, inner peace, compassion, and joy. Personally my yoga practice has become part of my life and lifestyle. The physical, mental, and spiritual benefits of the practice have helped me become more centered, grounded and connected into my self and my personal power. My body is as strong and subtle as it was in my athletic days and through my practice I have become more present and more joyful in each moment. My yoga practice truly feeds my mind, body and soul. MM: Paddle boarding and surfing have become very popular and I know you enjoy mixing them with your yoga practice. How do they complement each other? CC: Two of my passions are both yoga and surfing, and more recently I have been enjoying SUPing. There is nothing that makes you feel more alive then being totally engrossed in the present moment, and when you are in the ocean you have no choice but to be present. Yoga, in addition to building strength, body awareness and agility, helps build focus and concentration-all things you need in the water!! MM: You have the most gorgeous hair. What products do you use to keep it shiny and healthy? CC: Thank you! I use Pureology shampoo and conditioner. I also eat a lot of avocados and coconut oil! MM: What are some of your favorite healthy snacks? CC: I love Keen-wah coconut almond bars, apple slices with raw almond butter, raw kale chips, and dark chocolate! MM: How did the idea for namasDAY develop and what do you hope people get out of it? CC: September is National Yoga Month & namasDay is all about celebrating yoga and introducing yoga to as many people as possible around the country! Celebrate namasDAY on Thursday at your nearest Exhale Spa location. Free classes will be offered throughout the day, capping off with a celebration of live music, healthy cocktails, and giveaways in the evening. 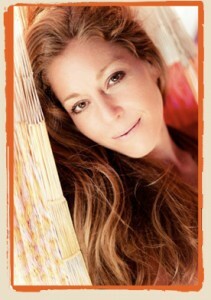 Cristi is the Director of Exhale Center for Sacred Movement in Venice, CA, where she is a passionate yoga and Core Fusion teacher. A former elite-level gymnast and platform diver, she earned her degree in Kinesiology while training with the Olympic diving team. After an injury cut her Olympic dreams short, Cristi shifted her focus to helping others improve their level of fitness through personal training, Pilates, Core Fusion + yoga. In 2004 she joined exhale, and has since studied extensively with world-renowned teachers, including Saul David Raye, Shiva Rea, Seane Corn, Elisabeth Halfpapp and Fred DeVito. Cristi has combined her teachings, practice, and bright energy into a dynamic and unique classroom style that translates into an infectious energy that her students can’t help but feel during each class. Cristi has brought this energy across the globe, leading workshops, retreats, and bringing positivity with her to every corner of the earth. When Cristi isn’t teaching, globe-trotting, or keeping exhale Venice as the number 1 ranked yoga studio, you’ll likely find her surfing, playing in her Venice backyard, or doing back flips on Venice Beach! Melissa Meyers, our founder, shares her favorite personal snaps from backstage and front row. Rachel Zoe at the Piperlime store opening. Maggie Gyllenhaal front row at rag & bone. 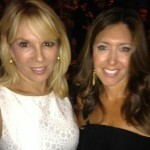 Ramona Singer and Melissa at Zang Toi. Gucci Westman and Karlie Kloss backstage at rag & bone. 90210 actress Shanae Grimes at Rebecca Minkoff. Sonja Morgan and Melissa together at Star Lounge. A favorite look from the front row at Rebecca Minkoff. Stylist Robert Verdi and actress Sami Gayle at Tracy Reese. Katie Lee and Melissa at the Tracy Reese show. 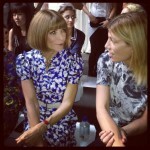 Anna Wintour and Dani Stahl at rag & bone. The Countess LuAnn DeLesseps and Melissa at Strut, The Fashionable Mom Show. Kirstie Alley enjoying a lollipop front row at Zang Toi. 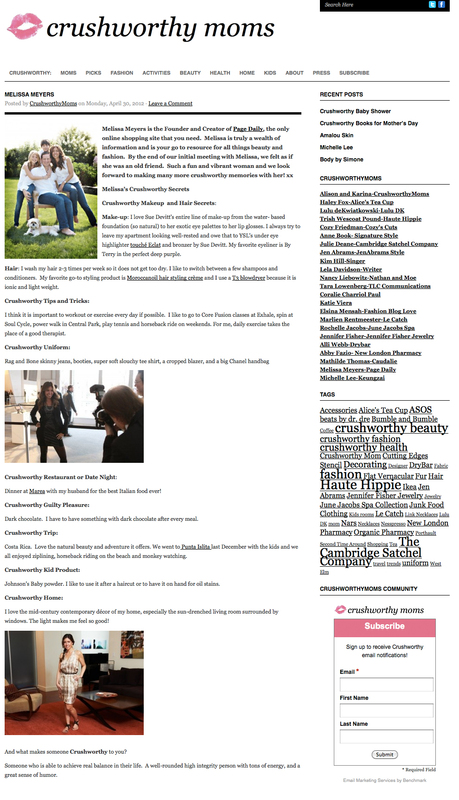 Stephanie Winston Wolkoff and Catherine Malandrino. Kelly Killoren Bensimon and Melissa at Alice + Olivia. A favorite look from the front row of the Tracy Reese show. Melissa with THE Anna Dello Russo. Zang Toi and his muse, Julie Macklowe. The iconic photographer Bill Cunningham at rag & bone. Christy Turlington and Melissa at rag & bone. Alice + Olivia’s Stacey Bendet. 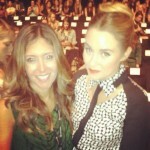 Melissa front row with Lauren Conrad at Rebecca Minkoff. A favorite from rag & bone. Kaylee DeFer from Gossip Girl with Melissa. Tinsley Mortimer at Alice + Olivia in NARS makeup. An Aveda braid at the Birchbox Sample Stop. I like to describe my every day personal style as classic with an edge. Here’s my take on a total rock star look… it’s casual without trying too hard and will be perfect for running around Fashion Week. First, start with a pair of your favorite skinny jeans. 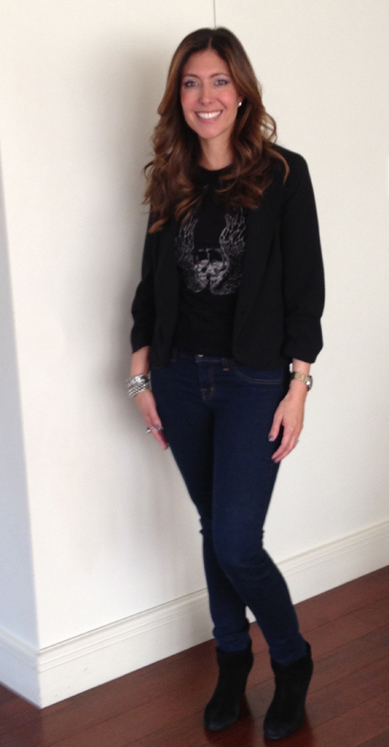 Wear something with skulls like this t-shirt underneath a cropped black blazer. Your shoes and accessories make all the difference when creating a rocker chic look. A pair of black suede booties add just the right amount of edge and they look fab with a variety of outfits. As for jewelry, I love to stack a few gunmetal-colored cuffs with studded details and funky rings worn on my index finger. And of course, a dark purpley-gray color on my nails! 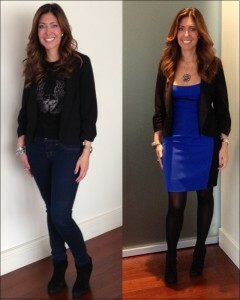 You can win a chance to join me in New York for the ultimate Rock & Republic Makeover and Fashion Week event! Attending New York Fashion Week is one of my favorite experiences of the year and I can’t wait to share it with you! I am so excited this year to be a member of the Kohl’s Rock & Republic Reporter Team! To celebrate the launch of Rock & Republic at Kohl’s starting Spring 2012, I will be attending the their amazing fashion show in February. Stay tuned for my updates from the show — I’ll be dishing on the styles seen on the runway and the celebrities in attendance! I’m Now a Curator for OpenSky! I wanted to let you in on an exciting new secret I’ve been keeping: I’m now a curator for OpenSky! OpenSky has recruited 80 of the best tastemakers in food, style, health and design to create a shopping experience that’s all about YOU. Check out my profile. Soon you will be able to shop my fashion picks at amazing prices. I’m so excited to share my personal style finds with my followers. What would you like to see in my OpenSky? I’d love your feedback. Happy shopping! It’s important to have basic pieces like a black blazer as one of your wardrobe staples. A few weeks ago, I picked up the perfect cropped black blazer in a recent shopping excursion with my daughter Rachel to Urban Outfitters. It hits the waist at the right place, has a slightly ruched 3/4 sleeve and looks great with just about everything. I wear mine with jeans or dresses and love the versatility. The fabric feels good and the quality is amazing for the price! I pretty much wear this ring every day on my index finger and it seems that everyone who likes it, buys one for themselves. The positioning of the skulls make it very subtle and understated so a great option if you want to keep your inner Goth under wraps. 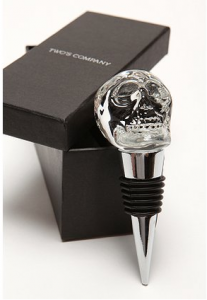 My daughter Rachel and I were perusing Urban Outfitters for family holiday gift ideas and found this skull wine stopper. Priced right and makes a great stocking stuffer. 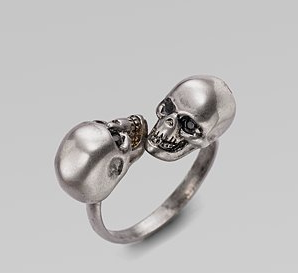 I can’t help selecting another accessory from Alexander McQueen. 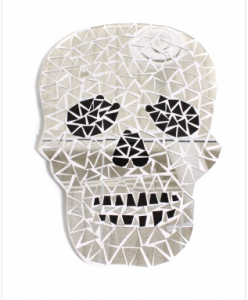 I saw this scarf and love the lavender skulls (I am currently obsessed with all things purple). The cashmere will keep your neck warm this winter! Rachel and I popped into Kitson on a quick shopping excursion when we were in LA a few weeks ago. We found this this cool mirror which now hangs in her room. I love it too! I think these cuff links are so hip and masculine. 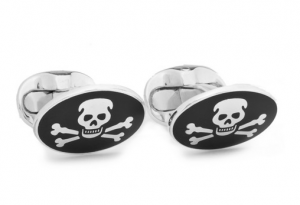 They are great for the male who is a bit rock and roll or biker chic.